Wondering how much it costs to install a ductless AC system in your older Minnesota home? The cost to install a ductless air conditioning system in Minnesota ranges from $3,500 to $15,000. While that’s a pretty pricey range, but here’s the good news: it’s cheaper than adding central air conditioning to a home with no ductwork. Let’s explore those cost factors in more detail. The number of rooms you want to cool affects how much you’ll pay. The more rooms you want cooled, the more you’ll spend to install a ductless system. A ductless system is comprised of an indoor unit and outdoor unit. So, for each room you want to cool, you’ll need to buy an indoor unit to go into that room. Luckily, the outdoor component in most ductless systems can serve up to 4 indoor units, so you may only need 1 outdoor unit. 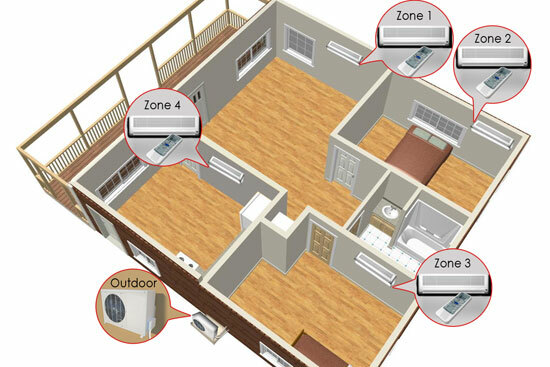 An air conditioning expert can explain more about zoning and the best way to set up your ductless system. The type of air conditioner you choose largely determines what you’ll end up spending on a ductless system. Air conditioner cooling capacity: AC cooling capacity is measured in BTUs (British Thermal Units). The more BTUs your system has, the more capacity it has to cool your home, and the more expensive it will be. A professional can help determine how many BTUs you need for your home. Generally, bigger homes require ACs with more BTUs. Air conditioner efficiency: The more efficient the AC, the more expensive it is. AC efficiency is measured by SEER (Seasonal Energy Efficiency Ratio). Most new ACs are at least 13–15 SEER, but ductless systems can be as high as 26 SEER. Though they’re more expensive up front, higher SEER units use less energy, which reduces your monthly energy bill. Besides the cost of equipment, you’ll also need to add in installation costs to get a sense of what you’ll pay for a ductless air conditioning system. Your home’s voltage: Smaller-powered ductless systems use a standard 110- or 120-volt plug, which is pretty standard in most homes. However, larger ductless systems require 220- to 240-volt plugs. If you need a larger system, you may need to hire an electrician to adjust your home’s voltage, which increases the cost to install a ductless air system. Your home’s construction: If your home’s construction makes it more difficult for a technician to install your ductless system, it will cost more. For example, if it’s hard to drill into your walls (to run lines through) because they’re too thick, your installation cost will be more expensive. The location of your indoor and outdoor unit: If they’re far apart from each other, your AC technician will have to run more line sets to connect them. Running more line sets makes the installation more expensive. The contractor you choose to install your ductless AC system greatly influences what you’ll end up paying. Installation estimate service fees: Because there are calculations involved in determining what type of AC you need for your home (Manual J Load Calculation), a contractor may charge a small service fee to perform this calculation. Flat-rate pricing vs. hourly pricing: Some contractors price installations based on the whole project cost (flat-rate); others charge by the hour + parts (hourly pricing). Knowing a contractor’s pricing method up front can give you a good estimate of what you’ll pay for the total ductless system installation. In addition to how a contractor charges for their services, you’ll also want to hire a contractor who does quality work. How can you tell if a contractor does quality work? By reading other customers’ experiences. Before you hire a contractor, check out review sites like ReviewBuzz and BBB (Better Business Bureau) to gauge customer satisfaction. If a company has high ratings, you’re more likely to be satisfied with your ductless system. Need a ductless system installed in your Twin Cities home? Contact MSP for an estimate to install a ductless system in your home. We’ll give you an honest and competitive quote, and we’ll help you choose the right system for your home and cooling needs. We’ve been trusted by families in Minneapolis-St. Paul since 1918. Window AC Unit vs. Ductless Mini-Split: Which Is Better for an Older MN Home?